A delicious rock deck for Legacy. 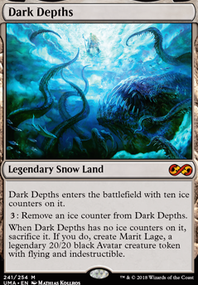 Jam packed with attrition, discard and a haymaker win condition in Marit Lage . This deck has it all. A clean discard suite and a removal package that makes Force of Will players quiver. This deck can play like lands or like a control deck while we assemble the win condition. I am relatively new to Legacy, although this deck is right up my alley. 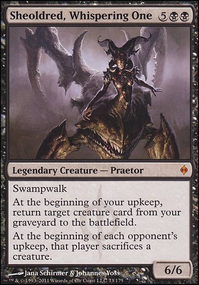 I play Jund in Modern and Rock decks in general have always been in my wheelhouse. I don't consider this a combo deck in that it's got a lot more to it than just digging for combo pieces and regurgitating cantrips. Dark Confidant and Sylvan Library supply card draw/filtering as if it were a blue deck. Thoughtseize and Duress are our Force of Will . And Crop Rotation is our silver bullet. The deck has a few variations that could be put together for relatively low cost and still perform with the best decks in the format. 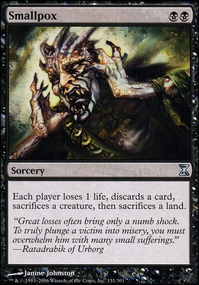 There are certainly bad match-ups in Mono Red Prison, and Death and Taxes. With the right draw and enough removal, there is an opportunity to get under both of these decks. Comments, Suggestions and +1 UpVotes are appreciated. I got a chance to play in the Philly Legacy Series EW 2019 Qualifier (Unfortunately, I had to leave after 3 rounds) but I was able to post a 2-1** record in my first ever Legacy experience. It was a blast! I went up against Burn Round 1 which was relatively easy to run over. Hand disruption kept card:eidolon the great revel off the board allowing me to make a pain free 20/20 in plenty of time to end the match in under 15 minutes. Round 2 was more of the same against Elves. Game one was a fast win with token:Marit Lage hitting for 20 on T3. Game 2 should have gone better but a severe misplay on my end cost me the game and eventually the match in Game 3. On turn 3 of game 2, I had Marsh Casualties and Flaying Tendrils in hand against a Dryad Arbor , Elvish Visionary and another 1/1. I didn't cast either in favor of some BS play I had in my head about copying Dryad Arbor with card:Thespian stage. They comboed off fetching a Craterhoof Behemoth and pumping everything for +5/+5. Game 3 they stuck Pithing Needle on Thespian's Stage and I couldn't find an answer for it in time. A Learning experience for sure. Round 3 was again Elves. I had T2 Dark Depths + Vampire Hexmage in Game 1 and Game 3. The second time they were able to Assassin's Trophy the Dark Depths in response to the trigger but a Crop Rotation brought out a second Dark Depths and Thespian's Stage put on the pressure. They took a turn digging for answers but came up short. 20/20 for the win. Vaccines can't stop it now!